Venezuela is in the beginnings of monstrous economic chaos, and it is no surprise that the “hidden hand” is emerging. There is a strong possibility that Venezuela is the potentially the next location of the proxy war between the United States and Russia. It may not be drastically evident right now, but if proven true over the next few months it will become extremely evident. Venezuela is actively claiming that the US is about to invade Venezuela amid the tensions that are rising in Latin America. The Venezuelan government also is claiming that the troops are for defending the country against invading US forces. The position of Venezuela as a country amidst the world is dwindling. For Venezuela, Martial Law is close, due to endless looting, rioting, and chaos. With the latest information, troops are amassing for the largest military drill of its kind. The real question is, how can the government afford an exercise when the people can’t even afford to have electricity? 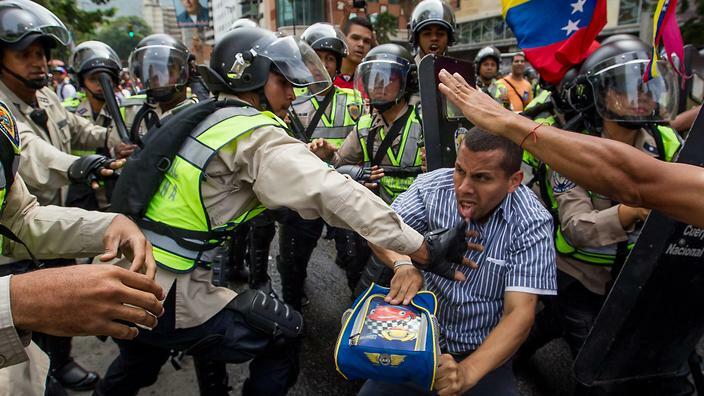 Venezuela is becoming a massive war zone, with opposition mounting to oust the sitting president and rightly so because of his enormous failure to lead Venezuela. However, there is another hand at play in this monstrous mess. Venezuela just so happens to be one of the richest countries on the planet. Now those riches are not in cash but rather in oil. Since oil is such a valuable resource, it is extremely likely that an outside force could be attempting to control Venezuela for the resources. War and desolation ravish the Middle East because of the resources that are housed by the countries there of. All wars are banker wars, and the coming Venezuelan war is no different. On countless occasions in recent years, the Venezuelan government has claimed that the US is attempting to insight violence, and spark a coup. Whether it is right or wrong, the US is heavily involved in the downfall of Venezuela, in some way, shape or form. The underlying reason for Venezuela’s economic troubles is traced to a failed government which abuses its power and its people, and the United States sanctions against Venezuela. All because the US seems hell bent on destroying Russia. The world is about to witness yet another proxy war because Russia and Venezuela’s relationship is very strong. Venezuela remains one of Russia’s closest allies in Latin America, and it is no coincidence that almost directly after the Ukraine situation, Venezuela becomes the next target. The US for the past 15 years has played some role in attempting to cause a coup in Venezuela which means that these are the beginnings of yet another proxy war. What took place in Ukraine was devastating, the only body of individuals who got injured was the citizens. Both Russia and the United States kept clean, as well as the Ukrainian government, all while the people of Ukraine suffered horrendously. Maduro announced the exercises last weekend, a day after pledging to prolong his government’s special emergency powers. In a rambling news conference on Tuesday, Maduro said U.S. spy planes including a Boeing 707 E-3 Sentry had entered the country’s airspace illegally this month. The nation is already on an elevated state of alert after the U.S. renewed a presidential decree that said the South American country is a threat to its national security, Padrino Lopez said. Maduro said he hoped the opposition would “give way” and cooperate in a process of peace. He didn’t offer further details. Rising political and economic tensions are gripping the country beset by the world’s highest inflation, shortages of basic goods, and currency controls. Discontent over a sinking economy and rampant crime sparked months of anti-government demonstrations that left dozens dead and hundreds injured two years ago. Next articleIs it true? Did the mark of the beast really just come about? !